Hey there, everyone! Welcome to my second post guest designing for Precious Remembrance Shop! I have enjoyed using the new Thanks Stamp Set so far this month, and I am excited to share my creations with you!! Valentine's Day is this week, so it seemed fitting to create some cards with a little bit of love in mind. Both of my cards that I will be sharing with you today use the CAS(E) This Sketch! #14, which is such a versatile & fabulous sketch! Flip it around in different ways, and you can create a completely different card each time!! 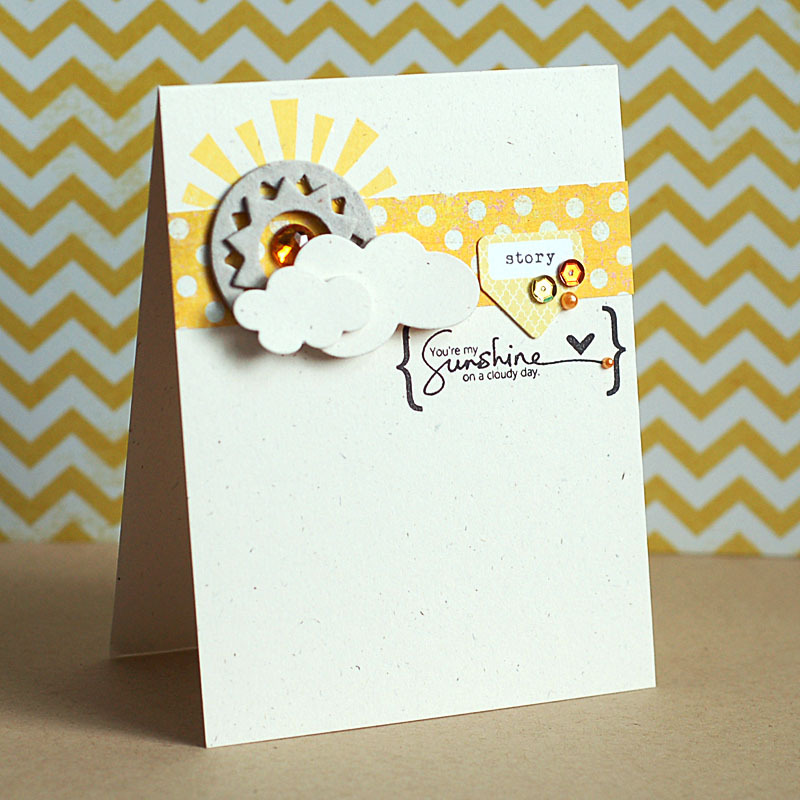 Up first is a card using the sunshine sentiment for the stamp set! 2. Cut a strip of yellow polka dot paper, and adhere to the top. 3. Stamp the sunrays to the top left side of the dotted paper. 4. Stamp the sentiment below the dotted paper with right hand alignment. 5. Layer the chipboard sun below the sunrays, then accent the middle with a yellow jewel. 6. Diecut the clouds from oatmeal cardstock, then layer to the bottom of the chipboard sun. 7. Add the story diecut, then accent with sequins & pearls to finish. Just a quick note on the supplies- the patterned paper I used here is from a 6x6 paper pad from Basic Grey called Shine On. After doing some research, this was a collection made exclusively for JoAnn Fabric Stores, but I am unsure if it is even still available in their stores. I received it in a publication incentive box from Northridge Media...and it is SUCH cute paper. If you can get your hands on it, definitely try! And this might be my favorite sentiment from the Thanks Stamp Set. It makes me think of the amazing people I have in my life that truly make me smile, no matter the storms of life that I might be passing through. Because I am not available every single Tuesday this month to post, I am doubling up on the Tuesdays that I do have available....so I have another card to share with you! This one is a little more traditional in terms of Valentine's Day and celebrating love! Check it out! 2. Cut an XOXO border from kraft cardstock & red cardstock. 3. Adhere the kraft border to the bottom of the card. 4. Stamp the row of X's directly below the border, then add the banner to the top of it. 5. Diecut a circle from oatmeal cardstock, then stamp the heart sentiment to it. 6. 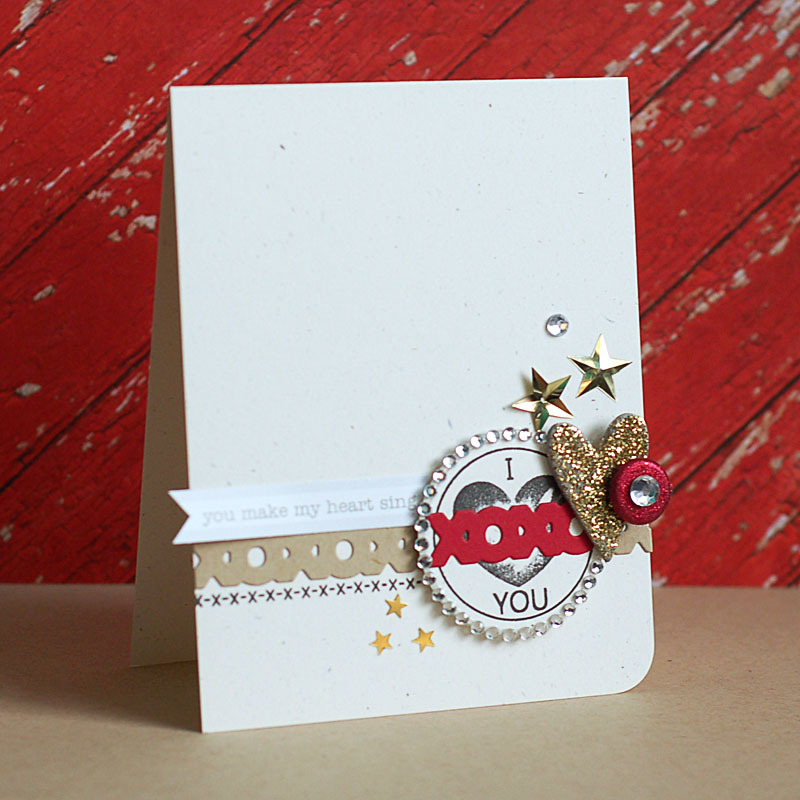 Trim the red XOXO border, layer to the stamped circle and adhere to the right side of the card. 7. Cover a chipboard heart in gold glitter, then layer to the right side of the circle accent with a red brad & clear jewel. 8. Add a jewel circle around the circle sentiment, trimming off the unnecessary section. 9. Embellish with gold star confetti & a clear jewel to finish. I hope that you enjoyed my cards today, and I will be back in another two weeks to share a couple more with you!! Have a great rest of your Tuesday!! Both are fantastic! The yellow card just brightened my day! These are so SWEET Lea. Love the neat images and fabulous embellishments. Absolutely gorgeous cards Lea, love them to bits! Lea: Thank you so much for sharing this first card in our challenge this week. I just LOVE having you join up with your adorable creations, and thank you for sharing with us. Thanks again for sharing and for being such a blessing to me. I pray that God will bless YOU for being so thoughtful! You've really showcased the versatility of the sketch (did you link it up in time? I hope so!) and I love the bold pops of red! Thanks so much for playing along with CASology this week! I love the look of the "messed up" heart. It looks like it was meant to be that way! Thanks for joining in on the fun at CASology this week! I like ! Fabulous design. Magnificent composition with your embellishments. Everything in simplicity. Bravo ! Prefect realization ! Great job here! So well done and absolutely gorgeous in its simplicity (which I know, really isn't so simple!). love the simple yet sophiscated layering, especially the first one. LOVE the cluster corner! Thanks for joining in at IBS! Beautiful cards Lea, love what you did with the heart stamp. Your cards are fabulous. Love the careful use of embellishment in such a precise way to give that card a simple yet classy feel. Fab job! Thanks for blessing us with your artwork at Word Art Wednesday this week. Hugs, always! My gosh, Lea! These are brilliant! Soo gorgeous! These NEED to be in print! Wow, Lea, these are both great cards! Love how you arranged the chipboard sun on the first (did you get that in an incentive box for the Nov issue of CARDS? I got it too! Loved your stuff in that issue). And the way the heart inked up on the second was a happy accident. :) So glad you came to play with us at IBS! Lea, totally amazing. Every time you post, I am in awe. But these CAS beauties...love them so very much!! Lea, you have two amazing cards here! Love the red XOs...adorable! Thanks for playing along at CASology this week! I'm loving BOTH of these cards! The first is so cheerful and I LOVE the gold and red combination of the second! These are both fabulous! I love that even with all the layers and details they still feel totally CAS! Thanks for playing along with CASology and CAS(E) This Sketch this week! Awesome cards, love the designs!!! These are both so fabulous, Lea! Love the yellow an cream on the first one and that clever chipboard sun! wow wow wow!!! These are stunning! I love the design and the stars on the second card! Thanks for joining us at V's Sweet Ideas! Beautiful card! How you managed to add so many little details, yet keep the card as simple as possible blows my mind!!! What a gorgeous work!!! Thanks for playing along with us at V's Sweet challenge!